Please pardon the interruption as we are currently undergoing a little move to a new home. We will bring you back to your normally scheduled programming shortly. Taking a page out of Steven's book over at My Life Outdoors, we too, have purchased a domain name for the blog. Our new address is now http://www.appalachiaandbeyond.com. Woohoo! Of course you will still be able to reach us through the blogspot address we've used for so long, as it will just forward you on to the new address. Anyway, it may take just a bit for the name change to travel through all the tubes, but before you know it you will be receiving your normal fix of Appalachia in no time. In the event you can't get here after a while, might I suggest blasting some lottery balls through the tubes, that generally blasts through the tube clogs of say poker chips and racing horses that get stuck from time to time. 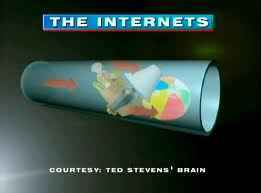 After all "the internets is a series of tubes not a truck you can dump stuff on."